The Towne Scoop - Welcome To The Towne Scoop Online! The Towne Scoop is an Old-Fashioned, Hometown Ice Cream Parlor. Come in and check out our themed store featuring The Towne Colors on our Maroon and White checkered floor and our expert scoopers who sport a fashion of a white shirt with a maroon apron and a fancy black bow tie. Spread the joy of Ice Cream with all your friends and family. 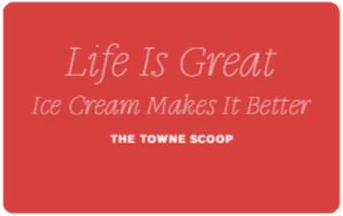 The Towne Scoop gift card is a great way to celebrate any occasion. Gift cards can be redeemed any time at The Towne Scoop or on our fleet of Towne Scoop Ice Cream Trucks.